My Occasional Blog: And We're Back! 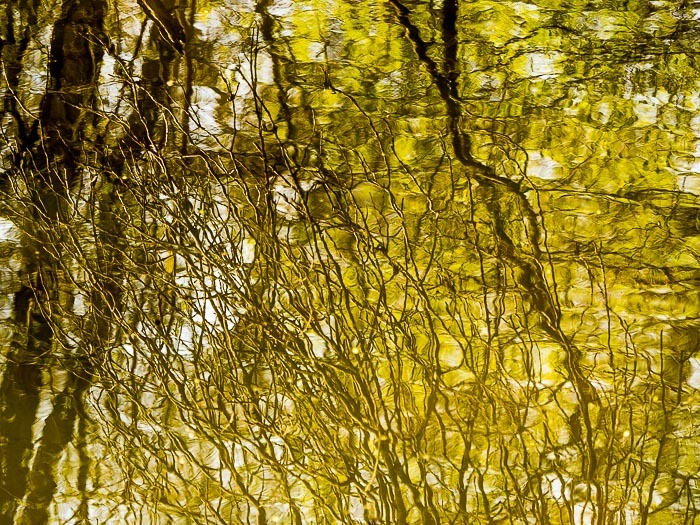 Reflection of tree branches in Minnehaha Creek in Minnetonka, Minnesota. One of the first photos I made with my new Olympus OM-D E-M5 Mark II bodies. We're back in Bangkok after our visit to the US. We went to see family, take care of some paperwork and shop. The shopping thing might seem a little out of place since Bangkok is a shopping hot spot but some of the things we wanted are more expensive here. I got a new set of cameras on this trip. I've been using Olympus E-P5 bodies and Olympus' excellent prime lenses as my main cameras for more than six months now, since back problems forced me to start carrying less heavy gear. One of the first stops I made when we got back to Minnesota was take all of my Canon gear, every single piece of it, to National Camera Exchange and trade it all in for two E-M5 Mark II bodies, the 12-40mm f2.8 Pro Zoom (equivalent of a 24-80 in full frame) and a 40-150mm f2.8 Pro Zoom (equivalent of an 80-300 in full frame). I worked with Erik, who evaluated my Canon gear and set me up with the Olympus gear. 1) I didn't want to deal with the scammers that inhabit the marketplaces of the Internet. 2) Time was important. We only had a couple of weeks in the US and I didn't want to get into a situation where I had all of the new Olympus stuff while I still had the Canon gear. 3) (and most important) Although I took good care of my Canon gear, the reality is that camera gear used by photojournalists gets beat up. My bodies had hundreds of thousands of clicks on the shutters and my lenses, some of which were over 20 years old, had issues. A couple of my lenses had fungal growth in them (it's so humid in Southeast Asia that fungus and mold grow inside lenses on the glass elements). It would have cost me close to $1,000 to get my lenses cleaned and brought back to factory specs. National Camera will take those factors into account when they prep my old gear for resale. By working with a professional camera buyer, like Erik, there were no surprises. I knew what I was giving him and he knew what he was getting. I know he won't come back and say that I sold him a piece of defective equipment. The next question might be why a brick and mortar store rather than the internet and something like Amazon or B&H? I'm glad you asked. I think it's important to support local merchants as much as possible. They provide jobs for our neighbors, they give back to the community, either through taxes paid or support of little league teams, scouting organizations or other nonprofits. In the case of camera stores specifically, they serve as a place where we (photographers) can go for help with new gear or just drop in, a meeting place of sorts. Many local camera stores sponsor workshops or contests. You can't get that from Amazon. I bought gear at National when I was a puppy photographer starting out, way back in the early 1980s, I like and trust them. When I was in Phoenix, I bought most of my gear from Foto Forum or Tempe Camera. There wasn't time on this trip to go back to them for this transaction so I went to National. I did shop at the B&H store when we lived in New York, but they were our local brick and mortar store back then. For me, buying gear through Amazon is the last option. Now I'm prowling the streets of Bangkok with the Olympus stuff and learning a new system. 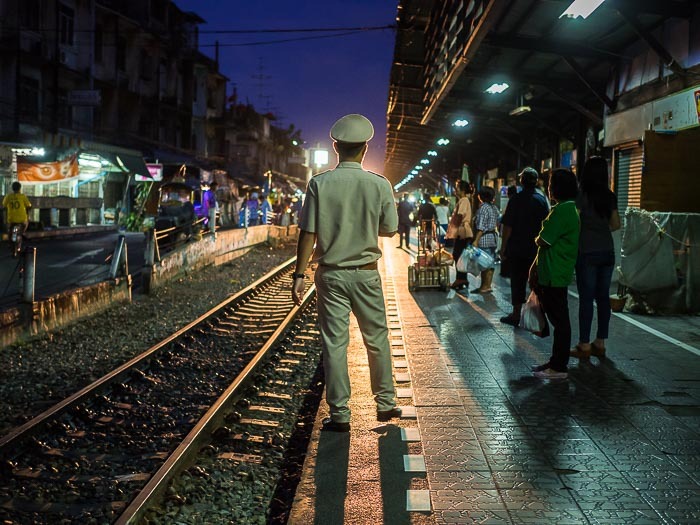 The first photo I made the OM-D E-M5 Mark II in Bangkok. Wong Wian Yai train station waiting for the 05.30 train to Mahachai.